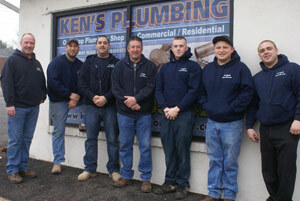 Ken Rammer settled into Edison in the early 1970's and provided the ground work for Ken's Plumbing. At the same time Michael Casper was raised in Edison and in the mid-1980's was building his home-based business. By 2008 Ken was looking to slow down and eventually partnered with Michael. There was a great deal of mutual respect for each others work ethics. Michael continues to run the business with customer service being top priority. Whether you're a homeowner or business owner, we will make sure your plumbing is working properly so you're always comfortable in your own space. No job is too big or too small. Call us today at 1-800-696-DRAIN (3724) for more information or to schedule an appointment!